The Cambrian was a time of mild, equitable climate, when high sea levels covered extensive continental margins. Sediments deposited on the margins of one of the Cambrian continental masses, Avalonia, now form the type section in Wales. Modern dating techniques have shown that the Cambrian was of shorter duration than previously thought: the currently accepted duration is ~56 Ma, from 541 to ~485 Ma ago. The period occupies a special place in the study of paleontology, because it is in the sediments of Cambrian age that fossils “suddenly” become common for the first time. This effect has come to be known as the “Cambrian Explosion.” Most modern phyla capable of leaving fossils are known from the Cambrian, though, numerically, fossil collections from this interval are dominated by arthropods. Best known of these are certainly the trilobites. Much of our knowledge of early metazoan evolution has come from the study of three remarkable lagerstätten: Sirius Passet in northern Greenland, Chengjiang in southern China, and the Burgess Shale of western Canada. Extinction rates were generally high throughout the Cambrian, with two major peaks qualifying as mass extinctions. The Cambrian Period is the earliest period in the Paleozoic Era, the latter name meaning “ancient life” because this interval is characterised by the presence of distinctive fossils – such as the famous trilobites – which look very unlike more modern creatures. The Cambrian Period was erected by Adam Sedgwick and Roderick Murchison (1835) who named it after the Roman name for Wales, Cambria, where he was mapping. Although the Welsh rocks were first to bear the name Cambrian, the oldest beds of the system are not well-developed there. The best sections, or at least the best studied, are to be found on the Siberian Platform and in China, although good sections are increasingly being reported from Australia and elsewhere, also. Two particularly famous fossil localities, at Chengjiang (south of Kunming, China) and Yoho National Park (in the British Columbian Rocky Mountains), have yielded thousands of spectacularly well-preserved fossils, revealing more about middle and late Cambrian marine life than we know about many younger times. Near the beginning of the Cambrian interval, life began to rapidly evolve from earlier cryptic forms, which were very poorly known until late in the twentieth century, into larger and diverse forms that have been known as fossils since the early 1800s. Famously, Charles Darwin was discomforted by the fact that the earliest fossils known in his time were already complex, obviously highly evolved, requiring earlier, simpler forms to be hypothesised. Precambrian fossils are no longer hypothetical: hundreds or thousands of different kinds are now known; many well-known (read more). However, it does really seem as if there was a sudden exponential increase in the numbers and diversity of different organisms in the early part of the Cambrian, an event known colloquially as the “Cambrian explosion”. “Adam Sedgwick named the Cambrian in 1835. He derived the name from ‘Cambria,’ the Roman name for Wales, site of the type area, in which shales and sandstones make up a section about two miles [~3 km] thick. Though these rocks are strongly folded and faulted, some are fossiliferous” (Stirton 1967, p. 68). In the 1830s, Sedgwick and Sir Roderick Impey Murchison, commenced work on the stratigraphy of northern Wales. Sedgwick began at the bottom of the section and Murchison at the top. Sedgwick named his sequence of rocks the Cambrian and Murchison applied the name Silurian to the generally more fossiliferous upper formations (Sedgwick & Murchison 1835). Eventually their sections overlapped, each claiming some of the same rocks for their systems, in what became a widespread and lengthy controversy until, forty four years later, Charles Lapworth introduced the name Ordovician for the disputed sequence. The type locality is in western Wales and is defined mainly by lithology. Since 1947, when H.E. Wheeler initiated debate with the suggestion that the Precambrian-Cambrian boundary should be based upon the first appearance of trilobites, much has ensued. Progress has largely been facilitated by the International Geological Congress (IGC) and the establishment in 1960 of a Subcommission on Cambrian Stratigraphy. The classical idea of placing the boundary at an unconformity has been displaced by the search for monofacial, continuous deposition sequences across the boundary, with the view to selecting a stratotype. The search itself produced a wealth of data from around the world – including the Palaeotethyan Belt, Siberian Platform, and England – eventually focusing upon south-east Newfoundland. Prior to 1990, the boundary was generally placed at the base of the Tommotian Stage. However, in 1991 the International Subcommission on Cambrian Stratigraphy made a decision to draw the base on the Cambrian at the first appearance datum (FAD) of the distinctive horizontal burrow ichnofossil, Treptichnus (formerly Phycodes and Trichophycus) pedum (Seilacher 1955; Fig. 1), in the reference section at Fortune Head. This horizon correlates with the base of the Siberian Nemakit-Daldynian Stage, ~13 Ma earlier than the Tommotian, included within the Vendian in some older literature. Both of these stages have since been abandoned by the ISCS, however. Presently, the early Cambrian is represented by the Terreneuvian Series, which is divided into the Fortunian Stage (basal) and “Stage 2”. This is unlikely to be the final word on the matter. Until 1991, when the base of the Cambrian was finally formally defined, the base of the Period was most often taken as the base of the Tommotian Epoch (and one still finds that, commonly). The new definition added the Nemakit-Daldynian (or Manykaian) below the Tommotian, enlarging the Period by approximately a half. Nevertheless, recent geochronological studies have provided absolute age estimates which actually reduced the understood duration of the Cambrian (Fig. 2). Thus, these studies have reinforced the impression that the events of the Cambrian occurred very quickly – of a “big bang” of animal evolution – by narrowing the available time, during which the apparent divergences appeared in the fossil record, to just a few million years. “Fossils are found in sedimentary rocks; these rarely contain minerals that both formed when the sediment was deposited and also have the right kinds of isotopes used for age determination. It has therefore been necessary to use isotopic dating techniques that are less certain than those applied to igneous and metamorphic rocks. As a result, the assumed age of the ... Precambrian-Cambrian boundary has fluctuated with the method of analysis. The latest approach – using an ion probe to measure uranium and lead (206Pb/238U and 207Pb/206Pb) in single crystals of zircon from volcanic ash beds – yields ages that are significantly younger than those obtained by other methods.... 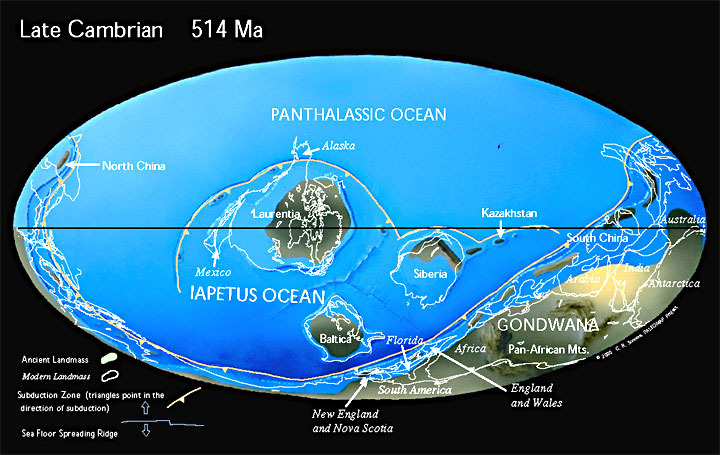 Thus the ‘textbook’ age of the Precambrian-Cambrian boundary has recently been reduced from 570-590 Ma to 530-550 Ma [the International Subcommission on Cambrian Stratigraphy has, for the present, settled on an age of 543 Ma for the Precambrian-Cambrian boundary]. This revision towards a younger age, if correct, is of some importance because the end of the Cambrian appears to be no younger than about 500-510 Ma [now settled at approximately 490 Ma]. Consequently, the Cambrian radiation of the Metazoa may have been compressed into a much shorter interval of time than previously considered possible – perhaps as little as ten million years” (Runnegar 1992, p. 70). The International Subcommission on Cambrian Stratigraphy has settled on an age of 541 Ma for the Precambrian-Cambrian boundary, and approximately 485 Ma for the Cambrian-Ordovician boundary (Cohen et al. 2015). These are the values adopted throughout this site. Fig. 2: Our view of the chronology of the Cambrian has changed over time, with the overall trend being a reduction in the supposed length of the Cambrian from almost 100 million years to just 56 Ma. Gondwana, comprising much of what is now India, Australia, New Zealand, Antarctica, Africa and South America, was a super-continent stretching from ~35ºN almost to the South Pole. North America and parts of Scotland were united in the subequatorial continent of Laurentia, surrounded by calm seas allowing the accumulation of extensive limestone deposits in marginal basins. Approximately 505 Ma ago, a mudslide on the western continental margin of Laurentia, in what is now eastern British Columbia, buried the famous Burgess Shale fauna. Other land masses included Baltica, comprising much of modern western Europe, also near the South Pole, and Siberia, which occupied equatorial latitudes. The Iapetus Ocean stretched between Laurentia and Baltica; present day Greenland and Scandinavia occupying the continental margins of Laurentia and Baltica, respectively. The north and south of present day China were separated, lying beneath shallow seas in northern tropical latitudes. The evidence concerning north Africa in Early Cambrian times is equivocal: paleomagnetic studies indicate a position near the South Pole, adjacent to the south of Gondwana, yet the faunas, which include coral reefs, are tropical. Avalonia, comprising Wales and parts of England, Newfoundland, New England and Nova Scotia, was also submarine at this time, and near the South Pole. Paleogeographic reconstruction for the Cambrian from Christopher Scotese’s excellent ‘Paleomap Project’. Although ice ages both preceded (Varanginian) and followed the Cambrian, during Cambrian times there was no significant ice formation. Global climate was probably warmer and more uniform than it is today. Earliest Cambrian assemblages contain few metazoan taxa, though, and the diversity of trace and body fossils grew only over a protracted interval. However, the basal Cambrian may play host to more animal diversity than is currently recognised: Although reports of fossilised eggs and other early developmental stages of marine invertebrates are rare, probably due to the difficulties of recognizing them, there is an abundance of small globular structures in the fossil record, leading up to and including the earliest Cambrian. In 1994, Zhang and Pratt reported Middle Cambrian spherical fossils, 0.3 mm in diameter, that under a smooth membrane preserved a polygonal pattern which they interpreted as remains of blastomeres belonging to 64- and 128-cell stages of arthropod embryos. Shortly after, in 1997, Bengtson and Zhao reported similar occurrences of globular fossils from basal Cambrian rocks. Moreover, their finds included eggs containing identifiable embryos of metazoans (Fig. 3, Fig. 4) including a probable arthropod (also see below). “[S]tudies of Cambrian fossiliferous strata in Siberia, China, Europe, and Australia have yielded an unexpected range of well-preserved phosphatic microfossils. Most are either tiny shells or the disarticulated components (sclerites) of a protective armour comprised of many parts (Bengtson et al. 1990). These microfossils have become familiar as the ‘small shelly fossils.’ Most are original phosphatic skeletons or phosphatic copies of other kinds of hard parts ...” (Runnegar 1992 p. 66). “Hyoliths and halkierids (extinct forms thought to be related to mollusks), true conchiferan mollusks and, perhaps, chaetognaths enter the record during the first 10 to 12 million years of the Cambrian, but crown-group fossils of most other bilaterian phyla appear later: the earliest body fossils of brachiopods, arthropods, chordates, and echinoderms all post-date the beginning of the period by 10 to 25 million years” (Knoll & Carroll 1999). “[A]lmost all major bilaterian clades already are represented in the Lower Cambrian, in remarkably preserved deposits such as the Chengjiang fossil lagerstätte. Fossil remains of diverse bilaterian forms from the Lower Cambrian have been obtained from many other regions of the globe as well. The latest Precambrian also has yielded trace fossils of unmistakable bilaterian origin. These remains indicate that major evolutionary diversification of animals had occurred by the onset of the Cambrian, and, therefore, more remote ancestral forms must have been alive earlier” (Chen et al. 2000, p. 4457). As a whole, the Cambrian metazoan fossil record is dominated numerically by arthropods, chiefly trilobites, of which there are over 100 Cambrian families. Next, but much lower in abundance, are Brachiopoda, represented chiefly by a number of inarticulate orders that may prove to merit class status. Hyoliths and certain members of the Mollusca, represented chiefly by monoplacophorans, form important though numerically minor elements. Fig. 3: Reproduction of fig. 1A from Bengtson & Zhao 1997, a SEM image depicting a suggested metazoan embryo – possibly Olivooides multisulcatus – at approximately the 256-cell stage. Sample is NGMC (National Geological Museum of China) 9351 from the basal Cambrian Dengying Formation exposed in the Shizhonggou section, Shaanxi Province, China; scale is 500μm. Fig. 4: Reproduction of fig. 1K from Bengtson & Zhao 1997, a SEM image of the cnidarian Olivooides multisulcatus. Sample is CAGS (Chinese Academy of Geological Sciences) 32372, also from the Dengying Formation exposed in the Shizhonggou section; scale is 500μm. The most widely known of the ‘cast of characters’ from the Cambrian are probably the arthropods. The late Stephen Gould (1989) is largely responsible for the popularisation of the Cambrian Arthropoda, especially the problematic forms, since reinforced by the likes of Briggs et al. 1994 and Conway Morris 1998a, although anyone with the most casual interest in paleontology would have been aware of at least the Trilobita before the publication of any of those books. The Cambrian wasn’t all exoskeletons, however. In fact, nearly all modern phyla are known as fossils from the Cambrian. Definitive representatives of all readily fossilizable animal phyla (with the exception of bryozoans) have been found in Cambrian rocks, as have representatives of several soft-bodied phyla. Sponges are generally accounted the most primitive of Metazoans, although probable cnidarians pre-date them in the fossil record. Both were well-established long before the Cambrian and are known throughout the period. Sponges are a major component in the Early Cambrian Chengjiang fauna, where they are second only to arthropods in both generic and specific diversity. About 1000 sponge body fossils, distributed among 15 genera and 30 species, have been collected there. “Archaeocyaths are an extinct group of sponges that had a very brief (geologically speaking) and spectacular history. The first archaeocyaths appear roughly 530 million years ago, during the Lower Cambrian. Archaeocyath species were very important members of Lower Cambrian communities. They diversified into hundreds of species during this time period and some of these species contributed greatly to the creation of the first reefs. Reef ecosystems tend to support a wide variety of organisms both in the present and in the past. Despite their great success in terms of numbers, the archaeocyaths were a short-lived group. They were almost completely non-existent by the middle Cambrian, some 10 to 15 million years after their first appearance” (Berkeley web site). Probable cnidarians are known from Precambrian sediments of the Twitya Formation in the Mackenzie Mountains, dating from as early as 600 or 610 Ma. The Twitya fossils are simple cup-shaped animals, possibly similar to the sea anemones of today. Fasciculus vesanus Simonetta & Delle Cave 1978 is a possible cnidarian from the Burgess Shale. More complex forms tentatively attributed to the Pennatulacea (sea pens) are members of the Ediacaran assemblage which persisted into the Cambrian, noteably at Booley Bay, in Ireland. Some other, more problematic, Ediacarans such as Kullingia also persisted through the Cambrian. Fossil ctenophores are seldom reported. Perhaps the earliest are the two Early Cambrian Chengjiang forms, Xianguangia sinica Chen & Erdtmann 1991 and Maotianoascus octonarius Chen & Zhou 1997. Form the Middle Cambrian comes Xanioascus canadensis Conway Morris & Collins 1996, known from the oldest of the Burgess Shale communities, found on Mt. Stephen in the Kicking Horse Shale Member. A slightly younger community from the Raymond Quarry Shale Member, includes Ctenorhabdotus capulus Conway Morris & Collins 1996. Gastropods, having planispiral shells with a wide, expanded aperture, make their first appearance in the Early Cambrian and seem to have been immediately and markedly successful. The earliest gastropods, such as Coreospira and Heliconella, are normally classified with the suborder Bellerophontacea although (a) they are not typical members of the suborder and (b) some authorities regard the Bellerophontacea as monoplacophorans rather than gastropods. Although the bivalves did not become common until Arenig (Ordovician) times, their minute, earliest representatives include Pojetaia, from the Early Cambrian of Australia (Runnegar & Bentley 1982) and Tuarangia, from the Middle Cambrian of New Zealand (McKinnon 1982). The former somewhat resembles the Ordovician palaeotaxodonts, and may have been an ancestor. Another Middle Cambrian form, Fordilla, is probably also a bivalve, though there is some debate on this point. The fossil record of annelids is poor: Ediacaran forms such as Dickinsonia and Spriggina have been variously interpreted as annelids, but at least the latter has also been proposed as an arthropod and the best that can be said is that such interpretations are speculative. The earliest undoubted annelid fossils are Early Cambrian, e.g. from the Chengjiang lagerstätte. The evolution and phylogeny of the annelids is also poorly known; most authors now treat the oligochaetes as a (paraphyletic) stem group. Arthropods probably existed before the Cambrian; Ediacaran organisms such as Diplichnites and Parvancorina may have been arthropods. In the very basal Cambrian Dengying Formation (central Guizhou, China) the microfossil Markuelia secunda is thought to represent an arthropod embryo (Bengtson & Zhao 1997). By Chengjiang times, arthropods had diversified to include more than twenty five genera, including many of the exotica found in the much younger Burgess Shale, so thoroughly popularised by Gould 1989. Stem-group arachnomorphs, such as the Nectaspida, had become both widespread and diverse. Best known of all the extinct arthropods, the trilobites were firmly established by this time, although their origins remain obscure. Today the Onychophorans are a special though almost insignificant arthropod subphylum represented by the terrestrial Peripatus and it’s allies. In the Cambrian, however, the Onychophorans were exclusively marine and represented by a number of taxa which were common at the time. Microdictyon is notable because its disarticulated plates are a common component of the so-called small shelly fauna. The earliest known brachiopods occur in Early Cambrian sediments and are already quite diverse. Three classes are recognised; and some authors consider the group to be polyphyletic. The Lingulata are a class of phosphatic-shelled inarticulate brachiopod; the genus Lingula arose in the Cambrian and persists today (possibly the best example of bradytelic evolution there is). The other classes, Articulata and Inarticulata, possess calcitic shells and are probably more closely related to each other than either is to the Lingulata. The earliest articulate group to evolve was the order Orthida. The earliest inarticulates may have appeared in the Middle Cambrian, but the group did not radiate substantially until the Middle Ordovician. The earliest pterobranchs, including the graptolites, first appear in the Middle Cambrian. Their origins are unknown (Rickards 1979). The oldest fossil graptolites are the benthic dendroids (order Dendroidea; planktonic graptolites did not arise until earliest Ordovician, Tremadoc, time). These were colonial organisms having a complicated construction, and rather long stratigraphic ranges at the generic level. The dendroids persisted until the Carboniferous. Several genera of chordate were already established by the time of the Early Cambrian deposition at Chengjiang (Conway Morris 2000). The better known Middle Cambrian Pikaia may have been something of a laggard. “Conodonts were the first vertebrates to produce a mineralised skeleton and species of Protopanderodus and Periodon were some of the first animals to inhabit the deep-sea realm. Crown enamel in Protopanderodus and Periodon records seasonally entrained growth and cyclical alternation of episodes of growth and function. Growth episodes spanned 7-10 days in Protopanderodus graeai and only 2-3 days in Periodonaculeatus. It is postulated the former had a pelagic/nektonic mode of life whilst the latter was nektobenthic and specialised to living in deep-water habitats. The growth of P. graeai is further characterised by two distinct phases, the production of a triangular, symmetrical ‘proto-element’ followed by addition of increments of different thickness to the inner and outer edges. The curved and twisted geometry of the adult element was not initiated until the second phase of growth. This has implications for the function of the proto-element and the mode of life of juvenile animals” (Armstrong & Smith 1999). The earliest record of a possible land plant is the Cambrian age Aldanophyton, unfortunately known from only a single occurrence in Russia. The original, and perhaps only detailed description is in Russian; information in English about this enigmatic fossil is difficult to come by. The most widely known of these is the Middle Cambrian Burgess Shale. Although this fossil site has been known since the early 1900s, very detailed study would not be accorded these fossils until the mid 1970s. The definitive popular account of this research, together with a contentious interpretation, is to be found in Stephen J. Gould’s book, Wonderful Life (Gould 1989). More recently, in the 1980s and ’90s, significantly older Early Cambrian lagerstätten have been located and studied at the Chengjiang and Sirius Passet localities in China and Greenland, respectively. Extinction rates were generally high throughout the Cambrian, typically between 20 and 30%, but two major peaks in the mid Cambrian (Upper Solvan) and at the close of the Cambrian (Dolgellian) qualify as mass extinctions. an imprecisely dated craton-wide drop in sea level (Sauk II – Sauk III event) that was terminated by widespread flooding in the Late Steptoean (mid-late Elvinia Zone time). The first two events are clearly global in scope, but the scale and timing of the sea level drop is not known in detail outside Laurentia. We have recently undertaken a project aimed at evaluating whether there are demonstrable cause and effect relationships among these events in widely separated Laurentian sections” (Saltzman & Runkel 2001). “Belts of Cambrian rocks with arc affinities in eastern Australia, Tasmania, New Zealand, and Antarctica are part of a singlec onvergenmt argin,a ctive over 30-40 Ma from the latest Early Cambrian to the Late Cambrian. … In the SE Australian and Tasmanian arc segments the proto-Gondwana plate subducted beneath the Pacific plate whereas subduction in the Antarctic and New Zealand segments was of opposite polarity. Common to most Cambrian fragments in SE proto-Gondwana is the tectonic overprint by the Ross-Delamerian orogeny from the Middle Cambrian to Early Ordovician…. A comparisoonf other Cambrian subduction-related rocks in Australia and Antarctica with the sections in New Zealand and Tasmania enables reconstruction of the nearly 5000-km-long Cambrian Pacific margin of SE proto-Gondwana. … At least one deformational event, possibly two, folded and disrupted the Cambrian sequence prior to the Devonian…. Both deformations indicate that a compressional tectonic setting in New Zealand had been present until the Late Cambrian” (Münker & Crawford 2000). In New Zealand, the Cambrian is known only from the Takaka Terrane, “the eastward of a pair of generally north-south trending terranes that form the ‘basement’ of west Nelson and parts of Fiordland” (Cooper 2004, p. 37; also see references therein). “Early Paleozoic rocks in New Zealand are confined to the western part of the South Island (Western Province) in Northwest Nelson, Westland, and Fiordland ... and the adjacent offshore region. Upper crustal sections of very low to low metamorphic grade are exposed in Northwest Nelson and Westland … whereas rocks exposed in Fiordland are their middle to lower crustal equivalents.... Cooper  grouped early Paleozoic rocks of Northwest Nelson in two tectonostratigraphic terranes, namely, the Buller and Takaka Terranes.... Cambrian rocks are confined to the Takaka Terrane. This terrane comprises arc-related volcanic and volcaniclastic rocks, carbonates, cherts, and quartzo-feldspathic sediments in its Cambrian part. Conversely, a passive margin sequence of mainly nonvolcanic, quartz-rich clastic sediments and carbonates makes up the Ordovician-Silurian part of the Takaka T errane. Both the Buller and Takaka Terranes were amalgamated to the Gondwana margin at latest by the Devonian, when they were intruded by the Karamea Batholith” (Münker & Crawford 2000). Armstrong, H.A. ; Smith, C.J. 1999: Environmentally entrained growth in the earliest vertebrate teeth. Palaeontological Association 43rd Annual Meeting, University of Manchester, 19-22 December 1999 (Oral Presentation). Bengtson, S.; Zhao, Y. 1997: Fossilized metazoan embryos from the earliest Cambrian. Science 277: 1645-1648. Science. Briggs, D.E.G. ; Erwin, Douglas H.; Collier, Frederick J.; Clark, C. 1994: The fossils of the Burgess Shale. Smithsonian Books: 1-256. Chen, J.; Erdtmann, B.-D. 1991: Lower Cambrian fossil lagerstätte from Chengjiang, Yunnan, china: Insights for reconstructing early metazoan life. In Simonetta, A.M.; Conway Morris, S. 1991: The early evolution of Metazoa and the significance of problematic taxa. Cambridge University Press: 57-76, pl. 1-3, text-fig. 1-7. Chen, J.; Oliveri, P.; Li, C.; Zhou, G.; Gao, F.; Hagadorn, J.W. ; Peterson, K.J. ; Davidson, E.H. 2000: Precambrian animal diversity: putative phosphatized embryos from the Doushantuo Formation of China. Proceedings of the National Academy of Sciences of the USA 97: 4457-4462. Chen, J.; Zhou, G. 1997: Biology of the Chengjiang fauna. In Chen, J.; Cheng, Y.; Van Iten, H. (ed.) 1997: The Cambrian Explosion and the Fossil Record. Bulletin of National Museum of Natural Science 10 10: 11-105. Conway Morris, S. 1998a: The crucible of creation. Oxford University Press: 1-242. Conway Morris, S.; Collins, D.H. 1996: Middle Cambrian Ctenophores from the Stephen Formation, British Columbia, Canada. Ph Tr Roy Soc Lond 351: 279-308. Ph Tr RS Lond. Cooper, R.A. 1989: Early Paleozoic terranes of New Zealand. Journal of the Royal Society of New Zealand 19: 73-112. Hou, X.; Aldridge, R.J.; Bergström, J.; Siveter, D.J. ; Siveter, D.J. ; Feng, X. 2004: The Cambrian fossils of Chengjiang, China. Blackwell Publishing: 1-233. Münker, C.; Crawford, A.J. 2000: Cambrian arc evolution along the SE Gondwana active margin: A synthesis ffrom Tasmania-New Zealand-Australia-Antarctica correlations. Tectonics 19 (3): 415-432. McKinnon, D.I. 1982: Tuarangia papura, n. gen. and n. sp. a late Middle Cambrian pelecypod from New Zealand. Journal of Paleontology 56: 589-598. Rickards, R.B. 1979: Early evolution of graptolites and related groups. Systematics Association Special Volume 12: 435-442. Rogers, J.J.W. 1996: A history of the continents in the past three billion years. Jl. Geol. 104: 91-107. .
Runnegar, B.; Bentley, C. 1982: Anatomy, ecology and affinities of the Australian Early Cambrian bivalve Pojetaia runnegari Jell. Journal of Paleontology 57: 73-92. Runnegar, B.N. 1992: Chapter 3 – Evolution of the Earliest Animals. In Schopf, J. W. (ed.) 1992a: Major Events in the History of Life. Jones and Bartlett, London: 65-93. Saltzman, M.R. ; Runkel, A.C. 2001: Upper Cambrian extinction, carbon isotope shifts and the Sauk II - Sauk III Sea Level Event: new evidence from Northern Utah, Newfoundland and the midcontinent. North-Central Section - 35th Annual Meeting (April 23-24, 2001) Session No. 3 Paleozoic Bio-events, Illinois State University, Monday, April 23, 2001. Sedgwick, A.; Murchison, R.I. 1835: On the Silurian and Cambrian Systems, exhibiting the order in which the older sedimentary strata succeed each other in England and Wales. London and Edinburgh Philosophical Magazine and Journal of Science 7: 483-535. Seilacher, A. 1955: Spuren und fazies im Unterkambrium. In Schindewolf, O.; Seilacher, A. (ed.) 1955: Beiträge zur Kenntnis des Kambriums in der Salt Range (Pakistan). Akademie der Wissenschaften un der Literatur, Mainz, Abhandlungen der mathematisch-naturwissenschaftlichen Klasse 10 10: 261-446. Simonetta, A.; Delle Cave, L. 1978: Notes on new and strange Burgess Shale fossils (Middle Cambrian of British Columbia). Atti Soc. Tosc. Sci. Nat., Mem., Serie A 85: 45-49. Stirton, R.A. 1967: Time, Life, and Man. Wiley: 1-558. Wheeler, H.E. 1947: Base of the Cambrian System. Journal of Geology 55: 153-159. Zhang, X.; Pratt, B.R. 1994: Middle Cambrian arthropod embryos with blastomeres. Science 266: 627-639. Science.